Take a gentle ride through “the wilderness in the city” of Bridal Trails State Park, then train for your next completion in the barn with our expert trainers — all within minutes of downtown Seattle. 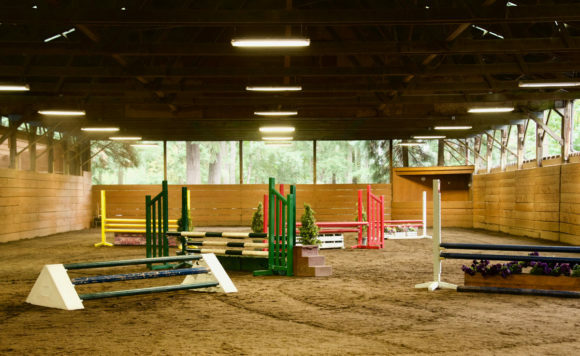 Parkside Stables is set on three acres, abutting 640 acres of Bridle Trails State Park, six miles from Seattle. Horses enjoy extra large stalls, five spacious paddocks, dedicated onsite medical care and daily exercise. Our training arena and state of the art equipment and footing, prepares riders and horses for top competition in Hunter, Jumper and Equitation equestrian disciplines. Riders and families enjoy a safe, customized training program, lockers, covered arena, heated viewing area and a supportive, inclusive, friendly, horse-loving community. Parkside Stables is a full service barn, and we can care for all your riding-related needs. Running an active barn takes some effort. How much? Check out Parkside, by the numbers.